An interesting way to elevate eggplants is to stuff them. They look impressive and taste amazing. 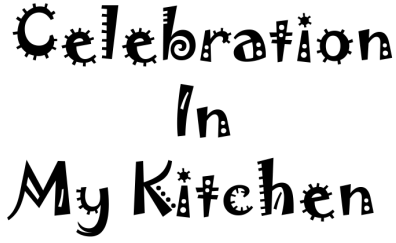 Stuffing can vary from prawns, ground meat (as desired) and vegetables (paneer, potato or a mixture) flavoured with various spices. 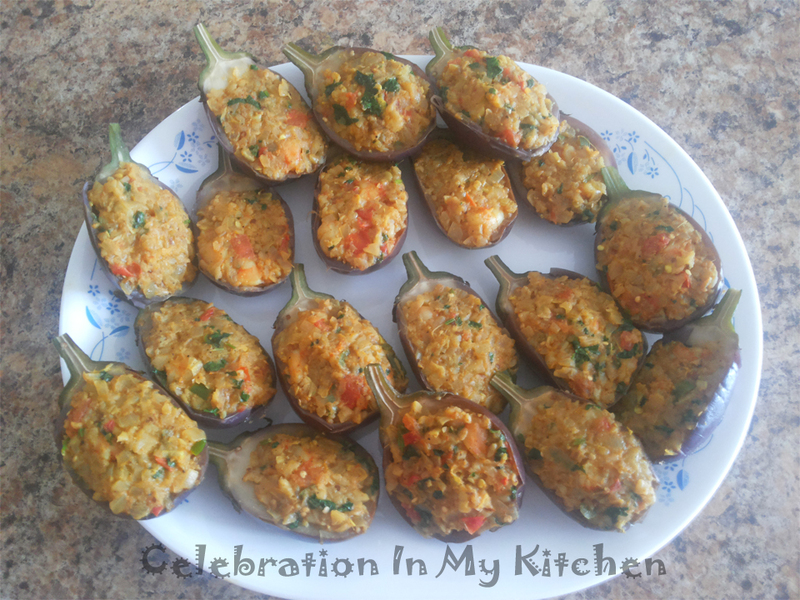 Stuffed eggplants can be served as a starter or side dish with the main meal. The eggplants are cut lengthwise with part of the stalk left intact, then parboiled, pulp scooped which was pulsed in the processor and cooked with the filling. I have used large prawns in the filling and cut them into small pieces. They were stirred with sautéed onion, green chillies, garlic, ginger, tomato and spices with the pulp mixed in at the end. 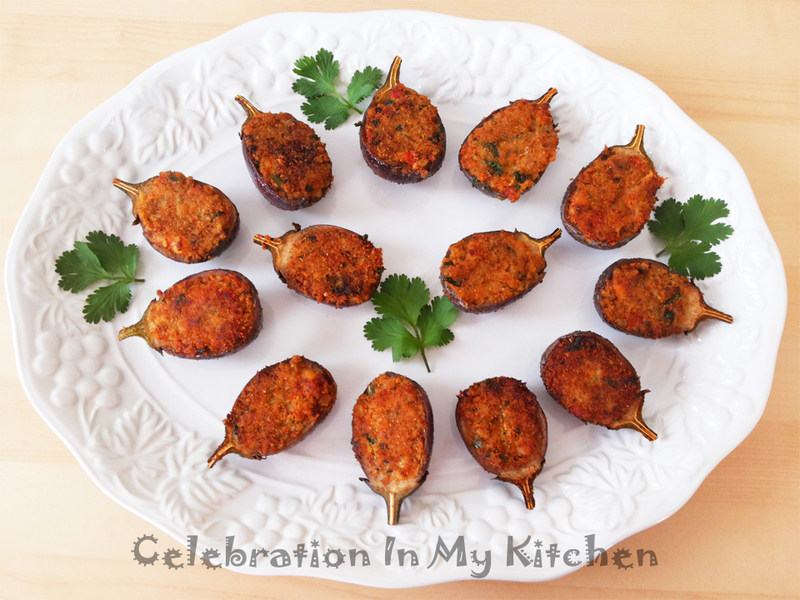 Garnished with coriander leaves, the filling was stuffed into the eggplants topped with breadcrumbs and shallow fried in extra oil. Alternatively, they can be baked. Working with small eggplants is definitely time consuming though they look dainty and presentable. Once stuffed, they are so delicious and irresistible. When purchasing eggplants, select ones that are firm, heavy, with a smooth skin and no brown spots. Some variety of eggplants are bitter and contain more seeds. Male eggplants have fewer seeds and less bitter, with shallow, round indent at the bottom. Female eggplants have an indent that is deep and shaped like a line. If prawns are large, cut them into smaller pieces. Wash, drain well and season with salt. Wash eggplants, leave 1/2" stalk and cut off the excess. Holding the eggplant upright, cut the eggplants in half lengthwise from the centre of the stalk. Place in a bowl of salted water for 15 to 30 minutes to remove bitterness and prevent them from oxidation. ​Drain off the water and once eggplants are cool to handle, scoop the flesh leaving 1/4" thick layer all around. Use a knife or kitchen sear to hollow out the flesh. Pulse flesh in a food processor to smaller bits. Set aside. Note: If eggplants have a lot of seeds, discard or rinse pulp in a colander before processing into smaller bits. 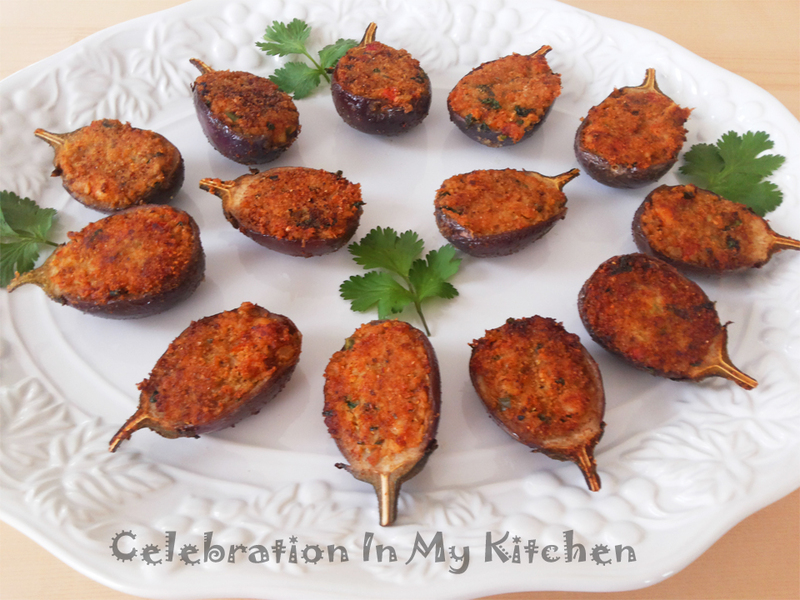 Stuff eggplants with prawn mixture and sprinkle breadcrumbs on top. Dust off excess crumbs. On medium flame, heat a frying pan with extra oil and fry four eggplants at a time placing the breaded side facing down in the oil. Tilt the pan and spoon hot oil on the top side (skin) of the eggplant. This will scorch and cook the skin. No need to flip. When the breaded side is golden brown, remove on absorbent paper towel placing crust side up. Serve hot as an appetizer or with the main meal. Alternatively, eggplants can be baked at 400 F or 200 C. Spray some oil on the crust and bake for 20 minutes or until golden brown. Prawns can be substituted with ground meat, vegetables or paneer.